Anyway, Math Curse is the first and the most clever. Mrs. Fibonacci the math teacher curses the hero of the story by telling him everything can be seen as a math problem. He starts to see math problems everywhere, sometimes real and sometimes silly. He quickly becomes overwhelmed and starts to spiral. 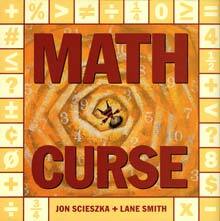 It is a very funny book with real math problems to solve and some silly nonsensical problems. The page layout and illustration shows how exhilarating and overwhelming math patterns can be. The ending shows how the hero has learned to master this school subject after all the math whizzing in his head finally starts to make sense. 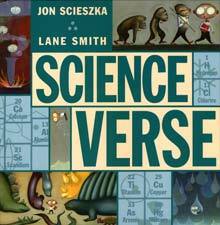 Science Verse has a new hero (who sits next to our math hero in class) being cursed when his teacher tells him to see the poetry in science. It turns into a book of poems about several different sciences. This one isn’t tied together in a story around the hero, the way Math Curse is. This hero just appears occasionally in what is essentially a book of poems. Some of the poems are extremely clever, like the page about nursery rhymes. Others are silly, some are just okay. But it is another educational but silly take on struggling with school subjects.